Here’s an interview with me on Cadalyst’s blog CAD speed. “Jimmy Bergmark of JTB World has decades of experience in the AutoCAD industry. That’s why he started his own business to help fellow CAD users. He agreed to share his experience in that industry with readers in this interview.” Read the rest here. JTB Align Plus 3.3 for AutoCAD is now released. JTB Align Plus is a great help when you want to align text or blocks to a line or curve. Here’s an example of aligning a block. Or if you work with P&IDs this makes the work go quicker. Feel free to visit our product page JTB Align Plus for more information and if you want to get a trial of the app. Do you spend time to locate the current drawing’s folder in AutoCAD’s file dialog boxes? No need anymore. With the help of JTB Current Folder every time you want to open a drawing, or attach external references, insert drawing as block or want to create a block, you will have a Current Folder item on the left of your file selection dialog box (in the custom places area). The Current Folder will bring your active drawing's path, which other ways is often several clicks away, to just 1 click away at your finger tip. 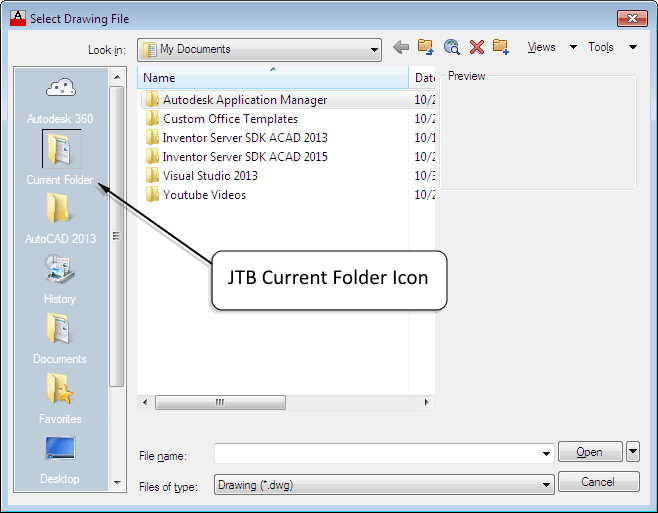 Give JTB Current Folder a try and see for yourself how convenient it is.